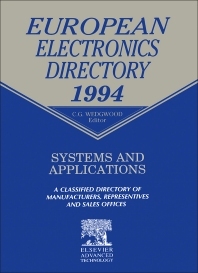 Companion volume to Components and Sub-Assemblies Directory, providing access to 8000 manufacturers, agents and representatives of electronics systems and equipment. Entries include names of key managers, addresses, fax/telephone numbers, and pocket descriptions of manufacturing and sales programmes. There is also a product index to track the companies involved in any given business lines. For Electronics, components and systems company marketing/product managers, distributors and agents. Abbreviations. Section 1 Directory of manufacturers. Section 2 Directory of agents & representatives. Section 3 Directory of sales subsidiaries. Section 4 Company index. Section 5 Products and services. Electronic hardware for: aerospace industry. automobile industry. banking. broadcasting & telecommunications. computers & data processing. education. environmental monitoring. graphic arts industry. households (consumer electronics). industrial applications. marine applications. medical applications. metal working industry. national defence. oceanology. office administration & automation. packaging machines. security & alarm systems. scientific research laboratories. supermarket & shops. textile machines. transport systems. miscellaneous dedicated applications. Software. applications software. operating software & utilities. task orientated software. Computing services. Research & development. Design, production & test equipment for the electronics industry. Design equipment & materials. Production equipment. Technical materials. Test equipment. Section 6 Index to products and services. Section 7 Glossary of German and French technical terms. Section 8 List of product numbers.